American comet probe. Studied interior composition of Comet Tempel 1. The flyby spacecraft carried a smaller impactor which it released, allowing it to study the plume from the collision with the comet on 2005.07.04. Comet impact and flyby satellite built by Ball Aerospace, JPL for NASA, USA. Launched 2005. Status: Operational 2005. First Launch: 2005-01-12. Last Launch: 2005-01-12. Number: 1 . Gross mass: 1,020 kg (2,240 lb). Comet Tempel 1 was discovered in 1867 and orbits the Sun every 5.5 years. Planning and design for the Deep Impact mission ran from November 1999 through May 2001. This was followed by the building and testing of the two-part spacecraft. The larger flyby spacecraft was designed to carry a smaller impactor to Comet Tempel 1 and release it into the comet's path for a collision on July 4, 2005. In January 2005, a Delta II rocket launched the combined Deep Impact spacecraft toward the comet. The combined spacecraft was to approach Tempel 1 and collect images of the comet before the impact. 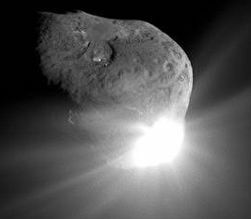 In early July 2005, 24 hours before impact, the flyby spacecraft would point its high-precision tracking telescopes at the comet and release the impactor on a course to hit the comet's sunlit side. The impactor was a battery-powered spacecraft that would operate independently of the flyby spacecraft for just one day. After its release, it was to take over its own navigation and maneuvers into the path of the comet. A camera on the impactor would capture and relay images of the comet's nucleus just seconds before collision. After release of the impactor, the flyby spacecraft was to maneuver to a path with a closest approach of 500 km from the comet. On July 4, 2005, the 370-kg impactor would hit the comet. On impact, a crater was produced expected to range in size from 10 to 100 m across. Ice and dust debris would be ejected, hopefully revealing fresh material beneath. After release of the impactor, the flyby spacecraft was to maneuver to a path with a closest approach of 500 km from the comet. The flyby spacecraft would observe and record data on the impact, the ejected material blasted from the crater using cameras and a spectrometer. This should reveal the structure and composition of the crater's interior. A shield was to protect it as it passed through the comet's dust tail. Thereafter the flyby spacecraft would turn to look at the comet again, recording additional data from the other side of the nucleus and observing changes in the comet's activity. The flyby spacecraft carried a set of instruments and the smart impactor. Two instruments on the flyby spacecraft observed the impact, crater and debris with optical imaging and infrared spectral mapping. The flyby spacecraft used an X-band radio antenna (transmission at about eight gigahertz) to communicate to Earth while monitoring the impactor on a different frequency. For most of the mission, the flyby spacecraft communicated through the 34-meter antennae of NASA's Deep Space Network. During the short period of encounter and impact, when there was an increase in volume of data, overlapping antennas around the world were used. Primary data would be transmitted immediately and other data stored and transmitted over the following week. 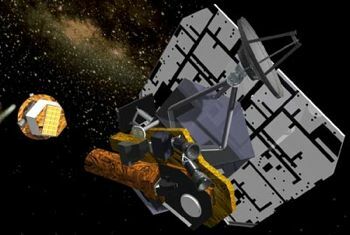 The impactor spacecraft was composed mainly of copper, which was not expected to appear in data from a comet's composition. For its short period of operation, the impactor used simpler versions of the flyby spacecraft's hardware and software - and fewer backup systems. The Deep Impact mission was a partnership between the University of Maryland (UMD), the California Institute of Technology's Jet Propulsion Laboratory (JPL) and Ball Aerospace and Technology Corp. The scientific leadership of the mission was based at UMD. Engineers at Ball Aerospace designed and built the spacecraft under JPL's management. Engineers at JPL controlled the spacecraft after launch and relayed data to scientists for analysis. The entire team consisted of more than 250 scientists, engineers, managers, and educators. Deep Impact was a NASA Discovery Mission, eighth in a series of low-cost, highly focused space science investigations. The Flight System was about 3.3m long, 1.7m wide, and 2.3m high. It consisted of two spacecraft: the flyby spacecraft and the impactor. Each spacecraft had its own instruments and capabilities to receive and transmit data. The flyby spacecraft carried the primary imaging instruments (the HRI and MRI telescopes) and the impactor (with an ITS telescope) to the vicinity of the comet nucleus. It released the impactor, received impactor data, supported the instruments as they imaged the impact and resulting crater, and then transmitted the science data back to Earth. The flyby spacecraft featured a high throughput RAD750 CPU with 1553 data bus-based avionics architecture, and a high stability pointing control system. The flyby spacecraft was three-axis stabilized and used a fixed solar array and a small NiH2 battery for its power system. The structure was aluminum and aluminum honeycomb construction. Blankets, surface radiators, finishes, and heaters passively controlled the temperature. The propulsion system employed a simple blowdown hydrazine design that provided 190 m/s of delta V. The flyby spacecraft mass was 650 kg. 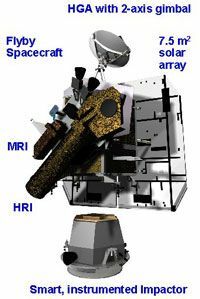 The primary instruments on the flyby spacecraft were the High Resolution Instrument (HRI) and the Medium Resolution Instrument (MRI). The HRI, one of the largest space-based instruments built specifically for planetary science, was the main science camera for Deep Impact. It provided the highest resolution images via a combined visible camera, an infrared spectrometer, and a special imaging module. The HRI was optimally suited to observe the comet's nucleus. The HRI had a diameter of 30 cm, a focal length of 10.5 m, a field of view of 0.118 degrees, and an expected resolution of 1.4 m at 700 km from the comet in the visible spectrum. Its infrared imager would provide lower-resolution images in the 1.05 - 4.8 micrometer band. The MRI served as the functional backup for the HRI, and was slightly better at navigation for the last 10 days of travel before impact due to its wider field of view, which allowed it to observe more stars around the comet. The difference between the two was the telescope, which sets the field of view (FOV) and the resolution of each. The MRI had a diameter of 12 cm, a focal length of 2.1 m, a field of view of 0.587 degrees, and a resolution of 7 m at 700 km range. The impactor guided itself to hit the comet nucleus on the sunlit side. The energy from the impact was to excavate a crater approximately 100 m wide and 28 m deep. The impactor separated from the flyby spacecraft 24 hours before it impacted the surface of Tempel 1. The impactor delivered 19 Gigajoules (equivalent to 4.8 tons of TNT) of kinetic energy to excavate the crater. This kinetic energy was generated by the combination of the mass of the impactor (370 kg) and its velocity when it impacted (10.2 km/s). Targeting and hitting the comet in a lit area was one of the mission's greatest challenges since the impactor would be traveling at 10 km per second and it must hit an area less than 6 km in diameter from about 864,000 km away. To accomplish this feat, the impactor used a high-precision star tracker, the Impactor Target Sensor (ITS), and Auto-Navigation algorithms (developed by Jet Propulsion Laboratory for the DS-1 mission) to guide it to the target. Minor trajectory corrections and attitude control were available by using the impactor's small hydrazine propulsion system. The impactor was made primarily of copper (49%) as opposed to aluminum (24%) because it minimized corruption of spectral emission lines that were used to analyze the nucleus. The impactor was mechanically and electrically attached to the flyby spacecraft for all but the last 24 hours of the mission. Only during the last 24 hours would the impactor run on internal battery power. The propulsion system used hydrazine provided 25 m/s of delta-V for targeting. The ITS on the impactor was nearly identical to the MRI on the flyby spacecraft. It differed only in that it lacked the filter wheel. The ITS had a diameter of 12 cm, a focal length of 2.1 m, and a field of view of 0.587 degrees. Expected resolution in the last image before impact was expected to be 20 cm at 20 km from the comet. Spacecraft delta v: 190 m/s (620 ft/sec). Electric System: 0.92 average kW. EPOXI successfully flew by Comet Hartley 2 on 4 November at 14:00 UT (10:00 a.m. EDT). The goals of the Deep Impact mission were to rendezvous with comet 9P/Tempel 1 and launch a projectile into the comet nucleus. Observations were made of the ejecta, much of which represented pristine material from the interior of the comet, the crater formation process, the resulting crater, and outgassing from the nucleus, particularly the newly exposed surface. The scientific objectives of the mission are to: improve the knowledge of the physical characteristics of cometary nuclei and directly assess the interior of cometary nucleus; determine properties of the surface layers such as density, strength, porosity, and composition from the crater and its formation; study the relationship between the surface layers of a cometary nucleus and the possibly pristine materials of the interior by comparison of the interior of the crater with the surface before impact; and improve our understanding of the evolution of cometary nuclei, particularly their approach to dormancy, by comparing the interior and the surface. This project was selected as a Discovery class mission in July, 1999. After the primary mission, Deep Impact was selected for a two-part extended mission designated EPOXI. The spacecraft consists of a 370 kg cylindrical copper impactor attached to a 650 kg flyby bus. The spacecraft is a box-shaped honeycomb aluminum framework with a flat rectangular Whipple debris shield mounted on one side to protect components during comet close approach. Body mounted on the framework are one high- and one medium-resolution instrument, each of which consists of an imaging camera and an infrared spectrometer which will be used to observe the ejected ice and dust, much of which will be exposed to space for the first time in over 4 billion years. The medium resolution camera has a field of view (FOV) of 0.587 degrees and a resolution of 7 m/pixel at 700 km distance and is used for navigation and context images. The high resolution camera has a FOV of 0.118 degrees and a resolution of 1.4 m/pixel at 700 km. The infrared spectrometers cover the range from 1.05 to 4.8 micrometers with FOV of 0.29 degrees (hi-res) and 1.45 degrees (lo-res). The total flyby bus instrument payload has a mass of 90 kg and will use an average of 92 W during encounter. The flyby spacecraft measures approximately 3.2 m x 1.7 m x 2.3 m, is three-axis stabilized and uses a blowdown hydrazine primary propulsion system with 5000 N-s RCS total impulse providing a total delta-V of 190 m/s. Communications with the ground from the flyby bus are via X-band (8.000 MHz) through a 1 meter diameter parabolic dish antenna mounted on a 2-axis gimbal or through a fixed low-gain antenna. Communication between the impactor and flyby spacecraft is in S-band. The uplink data rate will be 125 bps, downlink will be at 175 kbps. Power of 620 W at the encounter is provided by a 7.2 square meter solar array and stored in a small NiH2 battery. The spacecraft control system consists of four hemispherical resonator gyros, two star trackers, reaction wheels, and hydrazine thrusters. Pointing accuracy is 200 microradians with 65 microradian knowledge. Thermal control is achieved by insulating blankets, surface radiators, finishes, and heaters. The spacecraft has two redundant RAD750 computers with 309 MB each of memory for scientific data. The impactor projectile is made of primarily copper (49%) and only 24% aluminum so it will be easily identifiable and minimize contamination in the spectra after the projectile is largely vaporized and mixed in with the comet ejecta on impact. The impactor is a short hexagonal cylinder built above the copper cratering mass. It has a small hydrazine propulsion system for targeting which can provide delta-V of 25 m/s. Targeting is accomplished using a high-precision star-tracker, auto-navigation algorithms, and the Impactor Targeting Sensor (ITS), a camera which provides images for autonomous control and targeting. The ITS will operate until impact, and images will be sent back to Earth via the flyby spacecraft. Damage to the instrument due to dust in the coma may make imaging impossible duing the last minute or so before impact. Communication with the flyby spacecraft is via S-band. The impactor is mechanically and electrically connected to the flyby spacecraft until 24 hours prior to encounter. After separation it runs on internal battery power. Deep Impact launched on 12 January 2005 at 18:47:08.574 UT (1:47:08 p.m. EST) on a Delta II. The spacecraft transferred into a heliocentric orbit and will rendezvous with comet P/Tempel 1 in July 2005. Deep Impact was 880,000 km from the comet on 3 July 2005 moving at a velocity of 10.2 km/s relative to the comet. The projectile was released at this point and shortly after release the flyby spacecraft executed a maneuver to slow down relative to the impactor by 120 m/s and divert by 6 m/s. On 4 July the impactor struck the sunlit side of the comet nucleus 24 hours after release, at 5:52 UT (1:52 a.m. EDT). At 10.2 km/s velocity, the impactor had an impact energy of about 19 gigajoules, and hit at an oblique angle of approximately 25 degrees. Material from the nucleus was ejected into space and the impactor and much of the ejecta was vaporized. The flyby spacecraft was approximately 10,000 km away at the time of impact and began imaging 60 seconds before impact. At 600 seconds after impact the spacecraft was about 4000 km from the nucleus and observations of the crater began and continued up to a range of about 700 km, about 50 seconds before closest approach. At this point (about 961 seconds after impact) imaging ended as the spacecraft reoriented itself by 45 degrees to optimize protection from dust damage as it flew by the nucleus. Closest approach to the nucleus was at a distance of about 500 km. At 1270 seconds the crossing of the inner coma was complete and the spacecraft oriented itself to look back at the comet and begin imaging again. At 3000 seconds the spacecraft began playback of data to Earth at 20 to 200 kilobits per second. The comet and spacecraft were about 0.89 AU from Earth and 1.5 AU from the Sun during the encounter. Real time return of selected impactor images and flyby images and spectra were returned to Earth during the encounter. Primary data return took place over the first day after encounter, with a 28 day supplemental data return period. Earth-based observatories also studied the impact. The spacecraft ranged over a distance of 0.93 to 1.56 AU from the Sun during the primary mission. End of primary mission was August 2005. The total budget for the primary mission was $240 million. Deep Impact has been funded for an extended mission which has two parts. The Deep Impact Extended Investigation (DIXI) involved flying by comet 103P/Hartley 2 on 4 November 2010 at a closest approach of approximately 700 km. (The original target was comet Boethin on 5 December 2008) and returning images and data. The Extrasolar Planet Observation and Characterization (EPOCh) investigation used the Deep Impact imaging system to observe nearby bright stars with known large planets to characterize the planets as they orbit behind and in front of the stars and to search other planets in those systems. This phase of the mission began 26 January 2008 and continued until the end of July. The spacecraft made three close Earth flybys to target itself for Hartley 2, on on 31 December 2007, 29 December 2008, and 27 June 2010. The encounter with Hartley 2 took place on 4 November 2010 at approximately 14:00 UT (10:00 a.m. EDT) at a distance of roughly 700 km. The spacecraft and comet were 1.064 AU from the Sun and 0.156 AU from Earth at encounter. Approach phase angle was 86 degrees, MRI resolution at closest approach was 7 m per pixel. The two extended missions together are known as EPOXI. Total cost of the extended mission is $40 million. Comet 9P/Tempel 1 is a periodic comet which orbits the Sun every 5.51 years. It has a semi-major axis of 3.12 astronomical units (AU, the distance from the Sun to the Earth) and a perihelion distance of 1.5 AU, which puts it between the orbits of Mars and Jupiter. Its orbit is inclined 10.5 degrees to the ecliptic. The orbit has changed in the past but the perihelion has been within 10 AU for at least 300,000 years. The nucleus is estimated to be roughly 14 km long and 4 km wide. The perihelion occurs on 5 July 2005, the day after the encounter. The comet was discovered on 3 April 1867 by Ernst Wilhelm Leberecht Tempel and was first recognized to be periodic in May of that year by C. Bruhns. Comet 103P/Hartley, commonly known as Hartley 2, is a periodic comet which takes 6.46 years to orbit the Sun. Its semi-major axis is 3.46 AU with a perihelion distance of 1.05 AU and a perihelion date of 28 October 2010, 7 days before encounter. Its orbit is inclined 13.6 degrees to the ecliptic. The elongated nucleus is about 2 km long by 0.5 km wide. It was discovered by Malcolm Hartley on 15 March 1986. Family: Comet. Country: USA. Launch Vehicles: Thor, Delta, Delta 7925-9.5. Projects: Discovery series. Launch Sites: Cape Canaveral, Cape Canaveral LC17B. Agency: NASA, Ball. Bibliography: 2, 3660, 3661, 3662, 3663, 6447, 12204. 2005 July 3 - . Deep Impact, Impactor Release, Successful - . Nation: USA. Spacecraft: Deep Impact. 2005 July 4 - . Deep Impact, Comet Tempel 1 Impact/Flyby, Successful - . Nation: USA. Spacecraft: Deep Impact.